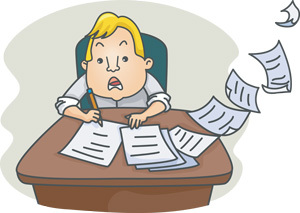 Stationary and stationery are two words that are commonly confused in the English language. Some native speakers don't even realize that there are two different spellings! After this lesson, you will be able to remember the differences in spelling and meaning between the adjective stationary and the noun stationery. In order to understand the differences between the two words, let's look at their definitions and examples. Stationary is an adjective that describes an object that is not in motion. It can describe a physical object or an unchanging condition. 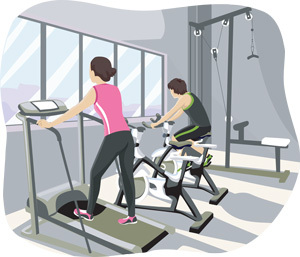 For example, a stationary bike is a bike that does not move, no matter how fast someone pedals on it (at the gym, for example). 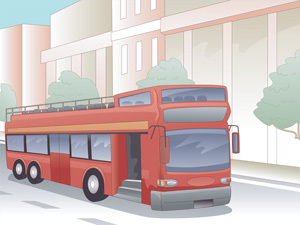 A bus is stationary when it waits at the bus stop to pick up passengers. When used to describe unchanging conditions, stationary means "stable." 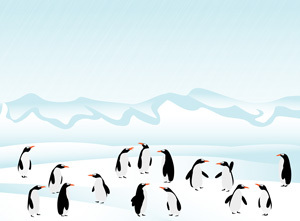 For example, a stationary population is one that does not rise or fall in numbers. His car remained stationary after the light turned green. I remained stationary so as not to attract attention. The desk is stationary because it is attached to the floor. The condition of our sick dog has remained stationary. Biologists are happy with the stationary population of the fish in the nearby pond. 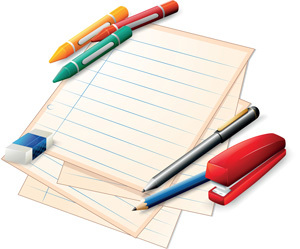 Stationery is a noun that means items used for taking notes or writing letters.  It is commonly used to refer to paper with matching logos and designs. This includes: paper, envelopes, pens, pencils, notepads, note cards, etc. Stores that sell these products are often called stationery stores. I bought stationery from the office supply store. May I use some of your stationery to write a letter to Jim? Molly used the hotel stationery to write a "thank you" message to the hotel staff. 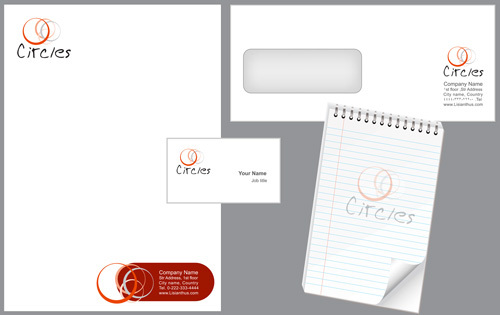 When writing to clients, please use our business stationery. Make sure you have a good supply of bank stationery for our customers. Stationary is used to describe the state of a physical object or condition, whereas stationery is a name for writing supplies. Aside from the meaning, the main difference you want to pay attention to is the spelling. To prevent spelling mistakes, remember that the "a" in stationary is like "at rest," and the "e" in stationery is like "envelope." Both of these words are pronounced the same way. They rhyme with dictionary. Sam works for a company that sells stationery. However, his work at the office doesn't progress because everyone bumps into his desk. His desk is on wheels and does not stay stationary. 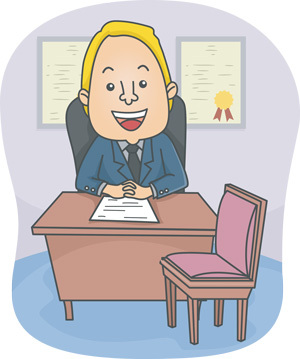 Whenever someone hits his desk, his stationery is not stationary, and spills onto the floor. He constantly has to pick up his stationery and re-organize the desk. One day, he becomes furious and decides to use his stationery to write a letter to his boss. My desk is located between the office and break room. Whenever my coworkers go to the break room, they bump into my desk and it does not stay stationary. When they hit my desk, my stationery falls to the ground and I cannot focus on my work. 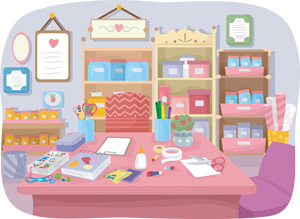 The number of reports I've turned in is stationary because I constantly have to re-organize my stationery! May I move to the back of the office? The next day, Sam is full of joy. Mr. Gollyson decides to give him a new stationary desk in the back of the office. He does not have to worry about re-organizing his stationery, and the amount of reports he makes is no longer stationary. 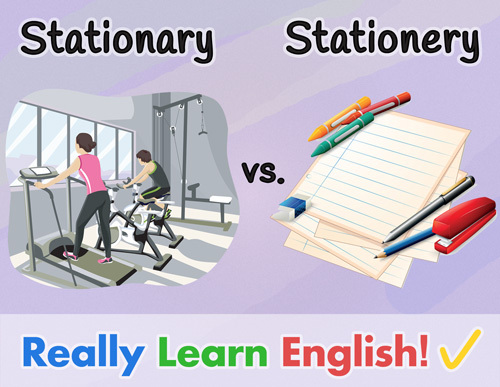 Which of the following is the correct definition of stationary? The liquid state of an object. The speed at which an object moves. Supplies used to take notes or write letters. A word that describes the state of an object or condition that doesn't move or change. Which of the following is the correct definition of stationery? The materials used for a painting. The desk someone uses at an office. I was able to ride the stationary bike down the street. I need to buy more stationery so I can write my mother a letter. The stock price has remained stationery. You can use my stationary to take notes. The office supply store ran out of stationery. Since my cup remained stationary the water didn't tip over. The stationery set came with paper, an envelope, and a pen. Please stay stationery while I cut your hair. Stationary is ___________, while stationery is ___________. The "y" in stationary is silent, while the "y" in stationery is pronounced. Both stationary and stationery are pronounced the same way. Stationary and stationery rhyme with carry. The "a" in stationary is a long vowel, while the "a" in stationery is a short vowel. All of my ___________ is white. The bench will remain ___________, no matter how hard you try to move it. The patient's condition is ___________ at the moment. Please give Paul some of your ___________ so he can write to his father.